Matilda borrowed this book from the library. This is a diary-style illustrated book about World War I. It’s by the same illustrator and author of Lighthouse Girl and Light Horse Boy. In the Lamplight is about a girl called Rose growing up in England. She joined the hospital to help out, hoping to become a nurse one day. In her diary you see her hopes and ambitions, postcards, photographs, and letters. There are also letters from soldiers to their loved ones, and sometimes from her brother to her. The book switches between a diary and a novel format. I liked how it shows a woman’s perspective of the war and how young some of the helpers were. Readers who enjoyed Lighthouse Girl and Light Horse Boy will want to read this book. I’d recommend it for 9 to 13 year olds. Read a sample chapter at the publisher’s website. Matilda is one of our regular book reviewers. You can read Matilda’s other reviews here. If YOU would like to send us a book review, check out our submission guidelines. Happy reading! Matilda reviewed her own copy of this book. This is the first book of four in a series about a girl who likes ballet and dreams to be a professional dancer. When war hits, that dream is proving to be hard, especially when her ballet teacher is taken away because she is part German. Alice has to face the truth that everything is not okay. I really liked this book because I love ballet too. This is one of the Our Australian Girl series and I’ve been reading books from this series for a long time. This is one of the best series I have read from their range. I recommend this book for children aged 8+. It’s very educational. Matilda is one of our regular book reviewers. Her most recent review (if you don’t count this one) was of The Flyaway Girls. If YOU would like to send us a book review, check out our submission guidelines. Happy reading! Kailani borrowed this book from the local library. Have you ever wondered what it’s like to live in the outback? Audrey lives with her dad, her mum, her little brother Douglas, her older brother Price and her special friend in the south Australian desert. Audrey’s dad spends most of his life away from home on the back of a camel. Audrey’s mum stays at home looking after the kids and doing cooking. Audrey is 8 years old and is always asking questions and has lots of clever ideas. Douglas is 3 and likes pretending to be a bird. Price is 12 and takes on the “Dad’s role” when Dad is away. And Audrey’s special friend? You will need to read the book to find out about him. I really liked this book, Audrey is very clever and light-hearted. My favourite part of the book was when Audrey and Price blow up the dunny!!! Audrey of the Outback is suitable for any ages especially kids 5 to 11 years. If you have ever wondered what it is like to live in the desert, meet a swaggie and blow up a dunny, you will really like this book. Kailani lives on K’gari (Fraser Island) in QLD. She really likes reading books, especially about horses, girls’ adventures, nature, the environment and some historical fiction. In 2014 her family travelled around Australia and now Kailani is writing her own blog called Kailani’s Island Life. Kailani’s most recent review (if you don’t count this one) was of The Quicksand Pony. If YOU would like to send us a book review, check out our submission guidelines. Happy reading! Celine reviewed her own copy of this book. Narmer is 12 years old, and is often referred to as ‘The Golden One’, by the people of his town because they believe that he has potential to be a ruler, to follow the footsteps of his father, the king. Although he is the second-born child, he is preferred by his father and was therefore chosen to be the heir to the throne. His older brother Hawk, is a pleasant and kind brother, and always treats Narmer with care. But as the days pass by, and Narmer becomes more worthy of the throne, Hawk may not want to be the gentle, caring brother anymore. After an awful incident with a crocodile, Narmer finds that he has been left with scars and wounds that may disable him forever. He may not have the strength to lead his people anymore. When a foreign trader arrives from another town to offer goods for gold, Narmer discovers his gift for trading. He decides to become one of the trader’s apprentices, and learns from the trader’s ways, as the trader and his travelling group continue to journey across the Nile. Will Narmer be able to survive this journey? What will become of his future? I admire Narmer because when times were tough, Narmer was resilient. He was daring, even as a little boy. This book is suitable for children aged 11 to 14 who enjoy historical fiction. If I were part of the Children’s Reading Council, I would award this book with the highest commendations. It is a must read for everyone! Celine is one of our regular book reviewers. Her most recent review (if you don’t count this one) was of My Life as an Alphabet. If YOU would like to send us a book review, check out our submission guidelines. Happy reading! Pippa borrowed a copy of this book from the library. Verity Sparks-Savinov has moved to a new country, with a new father and a brand-new mystery to solve. She has taken a new name, and made new friends. But she has lost her gift, her ability to find lost objects. Her father is eager for her to start at a select school for young ladies, but Verity isn’t so keen. She is more interested in the Ecclethorpe mystery, which seems to be leading them to dead ends. She meets a new friend, Poppy, and tries to find out who Lavinia O’Day is and why she is so sickly and frail. When her father is missing off a sunken ship in Queensland, will she find her gift before it is too late? I think this book is as good as the first book (The Truth about Verity Sparks), but you need to read that first. I rate it 9/10. Pippa is one of our regular book reviewers. Her most recent review (if you don’t count this one!) 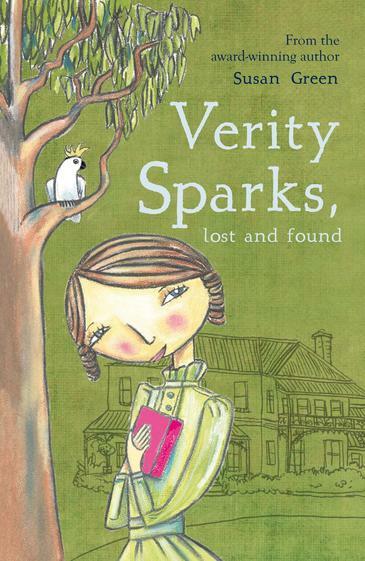 was The Truth about Verity Sparks. If YOU would like to send us a book review, check out our submission guidelines. Happy reading!